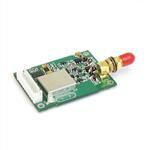 KYL-200L low power wireless transceiver module is a small size, low power consumption radio module. With high performance chip CC1020, it has good stability and reliability. It is widely used in remote control, industry automation, and wireless telemetry and so on.